Sounds like a reasonable plan! I wonder if you may be receiving too much moisture while the seeds are in the ground from December to whenever they germinate? Could sowing be postponed until maybe February or so for your latitude? Following the traditional rule in this location of not planting delicate seedlings outdoors until after Mother's Day, I sowed annual vegetable seeds indoors today with that one-month window of opportunity in mind. Some vegies with larger seeds might just as well wait to be direct-sown when the soil warms up outdoors, perhaps a week before the last expected frost date here (a week ahead of Mother's Day), with the assumption in mind that germination will take several days and nothing will protrude above the soil line any sooner than a week. I plan to do this with the calabash squash seeds that I purchased this past winter. But other vegies with tiny seeds that could be washed away by rains might do better sown in containers indoors and kept protected until they are large enough to withstand late spring storms. Tomato and pepper seeds come to mind. Tomato varieties: Volkov, Bloody Butcher, Glacier, and Stupice. For this purpose, I like the small peat pots which are sturdy enough to segregate seedlings, but also quickly biodegradable later once the entire pots are stuck in the ground. They come round or square-shaped, and cost about 10¢ each. I got two dozen, plus two dozen small wooden marking sticks and a permanent black marker. Now that it's nearly too warm to use the oven in the house, I was able to direct the top and bottom of my rectangular turkey roasting pan to another purpose, and placed a dozen pots in each half of the roaster. Each pot was half-filled with fine seed-starting soil and moistened, followed by the other half of the soil on top of that, and then additional moisture - enough that a small amount of water drained out the bottom of each pot. I used very warm water to raise the soil temperature a bit. Then I smoothed the soil surface in each pot so that it was level, and used one end of my permanent marking pen to dibble a shallow hole in the center of the soil in all the pots. I devoted one roasting pan to holding a dozen pots earmarked for the miniature sweet peppers, 6 of each of two varieties. The other roasting pan was dedicated to the remaining 12 pots: 3 each for 4 cool-climate tomato varieties. Seeds were evenly divided up and sown, and then the soil in each pot was pinched over them. Since I'm intensely interested in experimenting to discover what will succeed in this cool, moist climate, each pot was carefully labeled using one of the wooden marking sticks. These are biodegradable. The dozen zip-lock bags in each half of the roasting pan fit just right. In order to prevent damping-off of delicate seedlings, in which they seem to successfully sprout but then wither, I'll rely upon humidity to keep them moist by placing each pot in a small zip-lock bag and sealing it up tightly. I will not be watering them again until they are large enough to be placed outdoors, except possibly to add a little water to the bottom of the zip-lock bag itself. The less disturbance from me the better. These two-handled roasting pans can easily be transported to the most optimal location for the seedlings at any given moment: indoors near a window on chilly or stormy days, and outdoors in warm sunny weather. Will check back later to see how they are progressing. How are others timing and starting their seeds? All advice on methods welcome! until after Mother's Day, I sowed annual vegetable seeds today with that one-month window of opportunity in mind. Got behind this year in starting seeds as usual, but did manage to start a few tomatoes, tomatillos, sweet peppers, hot peppers, and collards. And your picture of the little peat pots was an excellent reminder that it's definitely time to start Yamiken seeds, Yamiken being a vey long season winter squash which requires about 150 days to mature, and which loves warmth and will wither and die if constantly cool. The beet and parsnip order has not arrived yet, and if much later, will be refrigerated and kept for next year. Your other post about too much moisture in December makes me think that's exactly what's going on with the parsnips. We had constant rain this past winter, and two minor snows that barely lasted a day or two. I suspect the parsnips (who are supposed to believe they are volunteers) just couldn't take the constant saturation, combined with below freezing temps. A seed can only tolerate so much abuse! I may need to revert to early spring planting of parsnips. We usually plant tomatoes in May, but always keep in mind the fact that in our micro-climate, we have lost tomatoes and peppers to frost on May 27. Not often, but once or twice is enough to be wary. I have occasionally in the past planted tomatoes in a warm April, and covered them every night, each with a drywall bucket. It protects the plants from frost, but is a LOT of work every morning uncovering, and every evening, covering. This year tomatoes and peppers will be in a "structure" (picture to follow soon) that will protect them from deer, rabbits, raccoons, squirrels and crows. In the past we didn't have much to worry about with squirrels and crows, but now they, too, have discovered the gardens. Once wildlife learn about your garden, they never unlearn it, and will be back forever, bringing their offspring, and their offspring's offspring. LOL! I wonder how they know the difference? Interesting that in your warmer planting zone, you get frosts at what is beginning to be our mid-'80s early summer temps. You're in a valley or a hollow, correct? Yes, is a narrow valley. We've had a number of days in 80's already, but it's those sneak-attack nights that come out of nowhere. Last week had three days in a row of 81 deg., and today was supposed to be 80, and felt like it but I never checked. Well, since this is SEEDS, here's an update that anyone who plans to grow some or all of their own food should ponder. Yesterday I spent several hours carefully planting the approx. 115 corn seedlings (Hopi Blue) that I had been sprouting indoors for over a week. The bed is well fenced, and is raised several feet, plus has cedar "sticks" across the top as a crow repellant. This morning I discovered that something, probably crows, plucked the seedlings right out of the ground, even though I assumed they were far enough along that they no longer were just seeds. All that work down the drain. It is a good lesson for any of us who think we can easily raise our own food, when we have false starts like that, and now it's back to the drawing boards. Yes, I'll replant, but not without covering seeds first. Gardening might be fun, but it's not easy. I am so sorry Ilinda that you lost your crop, but at least you lost it early, and there's still time to replant. My experience here, with highs running about 10 degrees cooler than your peak highs right now, is that until more of the wild plants finish greening up, the gardens are under wildlife pressure as an emergency food source for them coming out of winter. That's not to say that the animals stay away in warm weather, but rather that they need our produce less when other choices are available. That does't help much for crops that require a long season to put on substantial growth and reach maturity. We may in the end be forced to select species that animals have less interest in, and I guess that corn is a temptation to them. But on a larger farm such as yours, I'd be planting corn too. Crops that can easily and cheaply be purchased still from the grocer and can be stored easily for the long-term might be eliminated from the garden, leaving space to grow something that will succeed all the way to maturity. It's possible for example to store half a ton of popcorn (a quarter ton for each of you) while it's still cheap, which lasts forever if kept dry with DE or other desiccant, and possibly could be sprouted later if needed (if soaked first). Popcorn can be ground to make flour in a pinch, though I can't attest to the finished product of bread made from it. 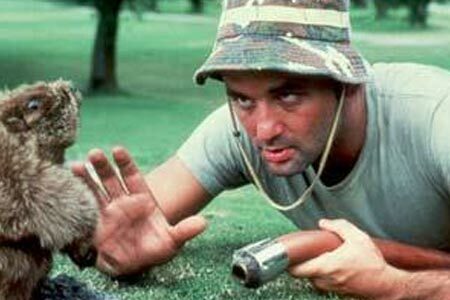 We're dealing with another kind of pest that can't be warded off by overhead cover, and that's the groundhog. Holes all over the yard right now, including the sunchoke beds, and I accidentally stepped into one the other day! Oh no, don't remind me of the ground hog issue. Decades ago our garden was raided somewhat by a family of them. They actually at times would sit at the edge of the garden and watch us work. Then when we went back to St. Louis, they'd dig in. Hadn't seen any for years and then last year and very recently, we have seen one. Well, my sympathies to you if you have holes all over your yard, as that means there's more than one, and possibly several families. Yikes. Good luck dealing with them, as I have no idea whatsoever on how to stop them. I wonder why yours disappeared for a while? We have no idea what happened to them for years and years? Even though they got some of our food, they didn't decimate the garden as rabbits, raccoons, crows and squirrels do. Maybe locals shot them when they came back to steal our watermelons and dig potatoes. Such a brash neighbor! How long were you all away? It was before we lived here. We bought the farm when we were young and camped here for years, and it was during that time when we came here on weekends, gardened, and went back to work in the city every Sunday night. Neighbor probably had a pulse on our goings and comings. Thankfully he's gone now.